Explanation: Most photographs don't adequately portray the magnificence of the Sun's corona. Seeing the corona first-hand during a total solar eclipse is best. The human eye can adapt to see features and extent that photographic film usually cannot. Welcome, however, to the digital age. 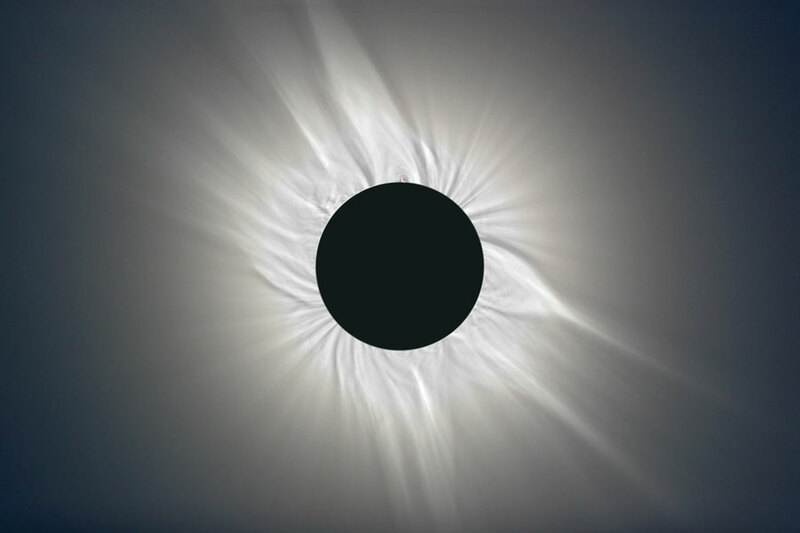 The above picture is a combination of thirty-three photographs that were digitally processed to highlight faint features of a total eclipse that occurred in March of 2006. The images of the Sun's corona were digitally altered to enhance dim, outlying waves and filaments. Shadow seekers need not fret, though, since as yet there is no way that digital image processing can mimic the fun involved in experiencing a total solar eclipse. Last week, a spectacular total solar eclipse occurred over southern Asia, while the The next total solar eclipse will be visible from the South Pacific on 2010 July 11.